Due to the Steve Cottingham announcement and subsequent Cracked Sidewalks commentary, we're slightly delayed in producing the Numbers Recap for St. Johns. In looking at the Four Factors, we actually found it somewhat surprising that St. John's ended up with a higher effective Field Goal Percentage (eFG%) than Marquette. We're sure that it didn't help MU to finish with only one FG over the last ten minutes. Marquette, as they do almost every single game, won the battle of turnover rates. Sloppy play managed to force Marquette into a higher percentage than average (18.3%), but we were still below an average rate of 20%. In addition, the strong recent play on the offensive boards continued. This was one of Marquette's non-conference strengths, but we faltered during early conference play. However, MU has won this factor in five of our last six games, and our numbers continue to improve. Finally, for St. John's to get a Free Throw Rate (FTR) of 93% is utter garbage. Marquette is one of the worst teams in the country at allowing opponents to get to the line (ranking of 285), but that percentage is only at 42.6%. 93% is a number that is nearly twice the average rate of one of the lowest in the country, and it's not like Marquette was fouling excessively at the end in order to catch up. Marquette's offensive FTR was also almost double our average figure of 26.2%. Maybe the refs should have swallowed those whistles a bit and "let them play". We're going to take a look at the Individual Player Review by addressing some recent comments in Rosiak's Blog. We've kind of been waiting for an opportunity to demonstrate that traditional stats may fall short, and his blog recap of St. John's is a nice chance. Credit where it's due - Rosiak does a nice job giving credit to Mbakwe (1.4 net points - starting his streak of never again having a negative net contribution), McNeal (7.8 net points - mostly on the defensive end), and James (5.4 net points - higher than average Offensive Rating). We'll look at James and McNeal a bit more below. When traditional stats are misleading - However, Rosiak also says "-- Wesley Matthews attempted just four shots. He hasn't gotten into double figures since Jan. 26 against DePaul." While this is technically true, it's also somewhat misleading. Matthews was a net positive contributor to the game with the highest Offensive Rating on the team. Since the DePaul game, despite being held below double figures, Matthews has had a net-positive contribution in every game except one. This means that Wesley is finding lots of other ways to make a positive impact on the game without scoring. In addition, Rosiak gives credit to Cubillan and Fitzgerald, even stating that "Dan Fitzgerald was highly productive in 19 minutes, finishing with five points, one rebound, one steal and one charge taken." Granted... charges taken don't show up in the box score, but his overall impact on the game (-0.4) was essentially zero and not highly productive. Furthermore, Cubillan had the worst net contribution of the team (-1.7). In general, we are big fans of Rosiak and we think he does a great job, but several of his comments were a clear indication of how traditional stats can be misleading. 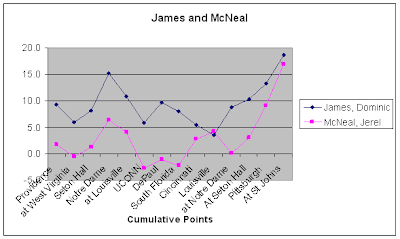 After we posted our Review of the Top Four, several blog comments referred to how similar the net contribution paths looked for James and McNeal. Indeed, tracking from Providence to Cincy shows an almost identical trendline. In addition, now that James appears to be back on track, the net contributions from McNeal have started to pick up again. There's nothing definitive that proves the two are explicitly correlated, but the joint trends certainly do suggest that McNeal's production is boosted when James plays better. This is just one more reason for optimism heading down the stretch... now that James is healthy, we appear to be getting more from Jerel again too. Great stuff on an impressive win. Looking to the future, 6-foot-5 swing man Nick Williams was teh top scorer (21 pts) and rebounder (12, yes one more than teammate Demarcus Cousins, the top junior forward in the US) as Leflore High School pulled away for a 74-45 win the the Alabama Southern Regional. Williams was named MVP of the sectional. The Rattlers led only 44-36 with 49 seconds left in the 3rd quarter with both their starting point guard and center (Cousins) on the bench with 4 fouls and facing a relentless press from Baldwin County. Williams took over both ball handling and clearing the boards to help outscore Baldwin County 30-9 from that point on and leave to a standing ovation in the closing seconds. Can't wait to see him at Marquette - a big, strong 6-5 that can definitely play. In the news conference after the game, his coach said, "We are sitting here on the way to another Final 4 for one reason - and he is sitting to my right. Noone thought we could come back with only one returning player from last years team, but they didn't realize that one player was a WARRIOR, Nick Williams." The Dad of one of his teammates said saw my Marquette shirt and said, "I am so glad Nick is coming to Marquette. I love Alabama, but Nick needed to get someplace where they understand and appreciate BASKETBALL, not just go to a football school."